As a birthday present, my mother gave me Alice Medrich’s new book, Chewy, Gooey, Crispy, Crunchy, Melt-in-Your Mouth Cookies. It has some interesting recipes, but the one I had to try first was “New Bittersweet Brownies”. Alice’s description of “brownies with a texture between very moist cake and rich chocolate mousse” which she goes on to call “an altogether new scheme for a new kind of brownie” sounded a lot like Miles of Chocolate, a popular dessert here in Austin which you can buy at Central Market or H.E.B.. The Miles brownies come sliced and refrigerated. They look like ordinary brownies, but one bite says otherwise. After making the Alice Medrich brownies and pondering over the idea of “newness”, I went on the Internet and found that this recipe was actually from Alice’s 2008 book, Pure Desserts. The recipe had been posted a couple of times, and a few people compared it with a similar recipe by Dorie Greenspan called French Brownies, which are similar to yet another favorite brownie recipe from Julia Child. All of these brownies with whipped eggs remind me of the Miles brownies. As for this one, I think the top is a lot flakier than Miles’s and the brownies seem a little sweeter and thinner. It almost goes without saying, but this is one of those recipes where your results will be only as good as your chocolate, so use the good stuff and at least 70% cacao. As much as I love chocolate chips, they’d be too sweet here and the texture would be off, so I wouldn’t advise substituting chocolate chips even if you’re desperate and they’re all you have around. Preheat to 350˚F. Line bottom and sides of 8-inch square baking pan with foil. I spritzed the bottom of the pan with a little cooking spray. Place chocolate and butter in heatproof bowl and set in wide skillet of almost-simmering water. Stir frequently until mixture is melted and smooth and quite warm. Remove from the pan and set aside. In a medium bowl (preferably bowl of a stand mixer) beat the eggs, sugar, salt and vanilla with a hand-held mixer on high speed until the eggs are thick and light colored, about 2 minutes. Whisk in the warm chocolate. Fold in the flour. Scrape the batter into the lined pan and spread evenly. Bake on center rack until a toothpick inserted in the center comes out clean, 25 to 30 minutes. Cool completely in the pan on a rack. Invert the brownies on rack and peel off the foil. Turn right side up on cutting board and cut into sixteen 2-inch square (or 9!). I cut mine into giant squares, but they’re pretty rich and 16 would be better. hope you had a wonderful (and non-traumatic) birthday! what a lovely gift from your mom! the brownies look heavenly – will have to give them a try. wishing you, the hubby, fuzz & lizzie a healthy, happy, prosperous new year filled with fun adventures (that you will, of course, report on) and chocolate, chocolate chocolate! This comment is unrelated to these delicious-looking brownies…I have a full carton of egg nog in the refrigerator that needs using up. What is your favorite egg nog-using recipe? I’m curious about these, too. 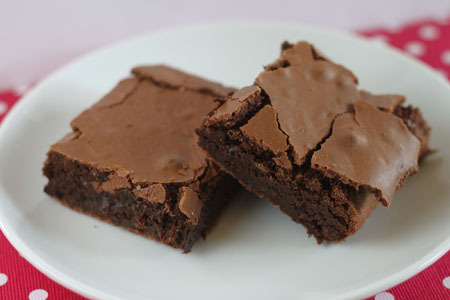 I’m actually not a huge brownie fan – don’t like fudgy, and if they are too cakey,well, they might as well be cake. Also don’t like too sweet. But very moist cake verging on mousse, that is intriguing. Is that accurate for these, rather than fudgy? And I’m also interested in cutting the sweetness, as others are suggesting. I have some organic Green & Black 72% Baking Chocolate, might that work for these? Anna, Are these overly sweet, or just sweeter than the Miles of Chocolate that you buy? I’m thinking that when I make them, I’ll swap out 1 oz. of 70% for 1 oz. of 85% chocolate. That should keep the chemistry about right. Dory Greenspan’s recipe is basically the same except twice as much butter, plus 2/3 cup nuts, so that would cut the sweet. These look fantastic! Next time I get some GOOD chocolate, I know what to do with it, thanks! Oh my goodness, these look amazing. For some reason I’ve had an aversion to making brownies with melted chocolate (not sure why xD), but I think I’ll have to try these. My mouth is watering! I want to try these, but I think I would try to cut the sweetness just a touch, as you said they are a bit sweeter. I love the crispy tops and the really dense fudgy look of the brownies.